During Christmas, many people choose to decorate their tree based on a certain color. Before you choose which beautiful color you want to adorn your Christmas tree, read some fact, and some interesting points regarding each color! Each color has its own meaning and its own personality. No matter if you are decorating based on what the color means, or you simply enjoy that color, we want you to see some of the points that personify each color! Silver and Gold are two metals, who have had gorgeous colors derived from their elemental color. Silver is most commonly associated with its namesake element. The metallic shine of silver is visually sensational. Though the color is often used to simply describe its namesake metal, silver can be used to identify so much more. The color silver has a meaning that transcends the vain pursuit of the precious metal. Silver means hope, hope to all who need it most. Many people in dire circumstances desire hope, and it comes. Clinging onto hope may be the only buoy in life, but there is always hope for a brighter and better day, shining brightly like the visually stunning metallic shine. Gold is one of the precious metals. In the 15th century though, it was first used as a color. Since then gold has become a facet of our society. From award shows, to trophies, gold is seen everywhere. The word is derived from the element gold, and therefore makes it seem prestigious. Gold means achievement, achievement by means of triumph. When these two colors meet, the result is truly resounding. 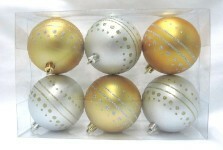 It is pure beauty, and when these colors are on ornaments your Christmas décor will shine beautifully! 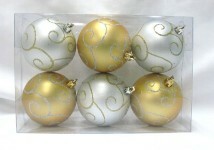 With Winterland Inc. you not only can show off the beautiful colors of silver and gold, but you can also rest assured that our ornaments will meet your high standards for quality, and beauty. We pride ourselves in making the best ornaments possible. The silver and gold ornament collection is one of stunning Christmas beauty, and we strive to ensure that the beauty of the color is matched by the quality of the product!